If we talk about tourist destinations in West Java, we will be faced with various locations that we can visit. It can be said that West Java is one of the provinces that has a lot of fun tourist destinations, and is always a favorite. One example is the city of Bogor, a city famous for its natural beauty. Little Venice Puncak or Peak in the Bogor Peak is quite famous place among tourists. Its strategic location and views of the area are very charming. This place is located in Kota Bunga Estate, Jl. Hanjawar, Ds. Sukanagalih Pacet, Cipanas, Cianjur. 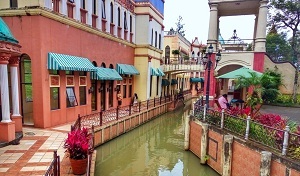 The atmosphere in Little Venice, the flower city of Puncak, is relaxing and quite romantic. You can enjoy the atmosphere together with your partner, while sitting on the gondola circling the area. Various buildings that exist in this tourist area itself are built in such a way as to truly give an impression like in Venice. It is best to visit this site in the morning because the weather is still very cool and not too hot. Do not come in the afternoon or too late, because this place is only open until late afternoon. Vacationing in this place will certainly be very pleasant. Another place you can visit in Puncak Bogor, Sakura Park, which is located in the Cibodas Botanical Garden. This one park has a large collection of cherry blossom trees that we can enjoy. The Cibodas Botanical Garden itself has approximately 435 cherry trees planted since 1971. As one of the natural nuances in Bogor, this location can be one of nature’s most enjoyable places to visit with family. If you want to see cherry blossoms in bloom then come between January-February and July-August. Between these months, you can enjoy the beauty of cherry blossoms. Not surprisingly, when the cherry blossoms bloom, so many make this place as one of the photo spots in Bogor that should not be missed. To reach this place alone is not too difficult, we just follow the road to Puncak. In addition there are always signs that ensure we will not get lost. This place located in Buana Jaya Village, Tanjung Sari District, Bogor Regency, this is one of the interesting and educational tourist attractions.. This Breeding reservation was built since 1993 was indeed very well known in the Bogor area. We can see and be close to the deer that are bred at this location. There are many types of deer that are bred at this location. One type of deer that is quite special in this location is the Bawean Deer which incidentally is an endemic animal in Bawean Island. To reach this place alone we will pass “testing” first. That is by passing a traditional bridge which is one way to enter a deer breeding place. After we pass the place, we will be greeted by a beautiful atmosphere and very comfortable. Not surprisingly, there are so many families who make this location as one of the mandatory tourist destinations while on vacation. 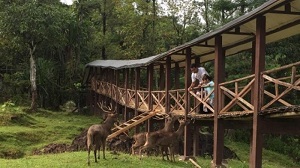 At this location alone you can not only see deer roaming freely, but you can also interact with the deer. Pancar Mountain Nature Park This one place is one of the locations of several tourist attractions in Sentul which are quite famous. 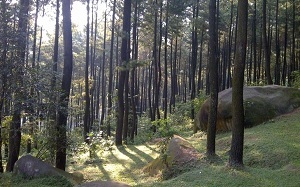 The Pancar Mountain Nature Park itself is very famous for its many pine trees. This dramatic and romantic atmosphere makes this location a very famous tourist destination in Bogor. Place in Kp. Ciburial Karang Tengah Village, Kec. Babakan Madang, Bogor Regency is always crowded on weekends or on holidays. Those who come here are mostly young couples who want to date. However, not a few also came to this location with their families. This comfortable and relaxing place indeed makes many people fall in love. Not a few who compare the location of this tour with the setting of a romantic twilight film against a background of pine trees. If you want to get a more romantic atmosphere. You can come early, when there is still a remnant of mist. At that time guaranteed, it will feel more romantic. That was the location of several tourist attractions in Bogor Peak that you can visit. Every tourist spot guaranteed not to disappoint you. It will even make your tour time more enjoyable. Hopefully, this information is useful.